I heard an insightful comment the other day “Entrepreneurs who’ve failed once are naturally drawn to the lean movement“. I figure that lean is a great teacher. It gives the entrepreneur a dispassionate framework to learn what thinking failed them and then adapt that learning to how it can be valuable in a larger context. Take for instance this commentary on the role of the Hunley, an early submersible that played an integral role in the evolution of the submarine. H. L. Hunley was a submarine of the Confederate States of America that played a small part in the American Civil War, but a large role in the history of naval warfare. The Hunley demonstrated both the advantages and the dangers of undersea warfare. It was the first combat submarine to sink an enemy warship, although the Hunley was not completely submerged and was lost at some point following her successful attack. An event that works will emphasize ingenuity over success and failure as it is in reality. Watching ingenuity unfold is also entertaining. That way curators are free of the pattern of chasing past successes to ensure the future success of the event. For instance, in the academic world the inventor of the Hunley would be encouraged to publish his work if he can demonstrate how it will eventually contribute to the realization of the submersible. Dutifully filed under a collection of ideas called “give it to me even if it’s buggy“. I picked up the book The Lean Analytics to read over the weekend. The Lean Analytics Cycle is diagrammatically explained in the book and the pdf screen-grab below should be useful for others who have the electronic copy of the book. The Mantra is – a good metric changes the way your organization behaves. From the book “The Lean Analytics”. 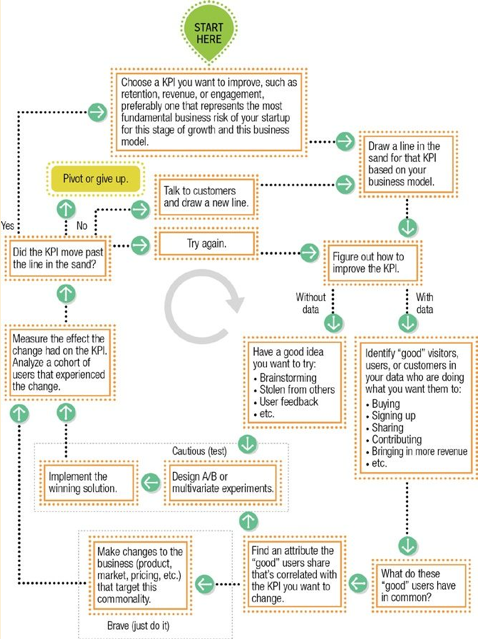 Get the Lean Analytics Cycle in .pdf. Search Engines automatically highlight display snippets of matched text from web page content to the search user to attract their attention and their clicks. In many cases this text may occur in the body and not in the meta description or title. For specific cases it might be wise to have no meta description at all. When competing for adjectives such as best, good, top – a silent description allows user generated content to bubble up to the search engine result page. Although this isn’t widespread public knowledge yet, it is apparent that the next round of usage patterns around services such as Dropbox and Google Drive are going to be determined by how you collaborate. Dropbox’s purchase of the service Mailbox was a dead giveaway that storage sync alone is no longer relevant. It did serve well to get Dropbox going. Another signal is Google Apps’ integration with Google Drive. Every time you send an email from within gmail with a Google Drive link, gmail will invoke a permission check (what all could they be checking for?). *Evan Williams on what users on the Web want.